Flight One Software is proud to announce it has reached a milestone in its update cycle for its flagship product, the GTN 750/650 Series. The award-winning avionics package now fully supports PC Trainer V6 plus some other exciting features. This major update allows users to navigate using a more recent navigation database from July 2016 (Cycle 1607). It also includes updates to SafeTaxi, airport charts, and basemap databases. Users can now create custom defined holds (unpublished) and have the ability of Search and Rescue pattern support. Flag Mountain Software and Aerius Designs are proud to announce that ATCPro, a realistic Air Traffic Control Simulation of the TRACON environment, is now available for download purchase. ATCpro is a revolutionary simulation written from the ground up that sets the bar high for a level of realism never before seen in desktop computer simulations. It authentically simulates the TRACON environment of air traffic control where aircraft are monitored on radar and guided to their destinations within 30 miles of major airports in the United States. It has been in development for over 2 years, by Flag Mountain Software and Aerius Designs, a team of software experts, aviation professionals and enthusiasts including real Air Traffic Controllers with more than 30 years professional experience. Flight One Software, in cooperation with Scenery Solutions, is excited to bring you the ultimate in terrain add-ons for Flight Simulator X Boxed and Steam Editions, Prepar3d 2.4+, as well as native support for Prepar3d V3. * A new multi-platform installer that supports all versions pf Prepar3D, FSX, and FSX Steam Edition in one download. * The entire road and railroad data set for Canada has been replaced, based on brand new commercial road data licensed from DMTI Canada. This results in 40% more roads added over UTX Canada V2. * Brand new landclass using the latest available data. This includes not only urban areas, but also vegetation landclass. The top 100 cities in Canada (by population) have been hand-classified for extreme accuracy. * V2 adds new autogen lighting to all UTX roads. * All new ground polygons including new versions for Cemeteries (5% more), Parks (46% more), Golf Courses (5% more) and Beaches (30% more). * New tunnels and tunnel entrances to match road and railroad features. The dev team for the award-winning Flight1 Citation Mustang has released an updated version of the aircraft, so it is now fully compatible with Dovetail’s Flight Simulator X Steam Edition. Customers of the product just need to download the add-on from the product page and reinstall it to have the option of installing it in FSX SE. The new Citation Mustang is a breakthrough combination of power, speed and true jet affordability. Certified to be flown by a single pilot, the Mustang features state of the art engines delivering speeds of up to 340kts as well as the latest in large-format glass-cockpit flight displays, easing pilot workload, all while passengers relax in one of the largest cabins in its class. 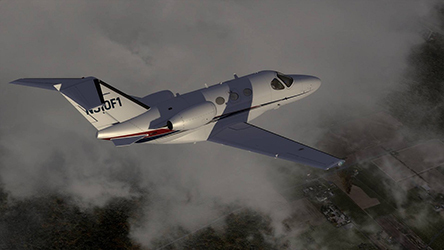 Flight One Software and Cessna Aircraft Company have joined forces to bring you an authentic simulation of this aircraft. To download the update or to purchase this great business jet simulation, go to http://www.flight1.com/products.asp?product=f1mustang for more information, screenshots, videos, etc. You can now experience a Flight1 award winning scenery product that changes the entire Prepar3D simulation ground texture and autogen world from pole to pole in one install. Ground Environment Prepar3D (or GEP3D for short) greatly improves the Prepar3D simulation world. Autogen has been meticulously placed and done so with reasonable virtual address space (VAS) consumption and overhead in mind. A secure backup is established by the product for easy and quick restore at any time. From Kabul to Kathmandu, from Cape Town to Anchorage Ground Environment strives to make the world look like the world and not sacrifice one part of it for another. Flight1 understands the importance of a free and open sandbox system where everyone should be able to enjoy their freeware and payware scenery products alike. Airport, scenery or photo-scenery products that work with default Prepar3D core control files will work with GEP3D. GEP3D is made to work just like the Prepar3D default texture system so you can be assured that your scenery add-ons will overlay and work with GEP3D the same way the default Prepar3D system allows. Following up with their highly-rated Flight Simulator 2004 and X releases, iFly is proud to announce that their iFly Jets: The 747-400 is now available for Lockheed Martin Prepar3d users. Taking full advantage of P3D’s updated engine, the iFly 747-400 gives P3D users a beautiful heavy iron aircraft for those long international flights or short charter hops with spectacular cockpit shadowing and reflections, high definition textures, plus much more.